1/ A woman hovers three bank cards near a POS machine in this Tuoi Tre photo illustration. Bank account numbers ending in ‘666’, ‘888’, ‘6868’, ‘7979’, ‘3939’, ‘33333’, ‘222222’, and ‘111111’ are believed to bring prosperity and luck to its owner, while circulatory, advancing or mirrored numbers such as ‘1515’, ‘12345’, and ‘1221’ are also sought after. Vietnamese lender Ban Viet, which has recently opened sale of 1,000 ‘lucky account numbers’, said owning one of these accounts would set a client off at least VND200,000 (US$8.63). The price for specific account numbers are not disclosed, as it depends on each agreement to be settled between the client and the bank, a Ban Viet representative said. At VPBank, a Hanoi-based lender, customers can own account numbers ending in a six-digit ‘prosperity’ string for a fee of VND10 million ($431). For five-digit and four-digit strings, the fees are VND5 million ($216) and VND2 million ($86), respectively. Account owners also have the option to customize their own account number for a fee of VND1 million ($43). Similar services are offered at other commercial banks including ACB. 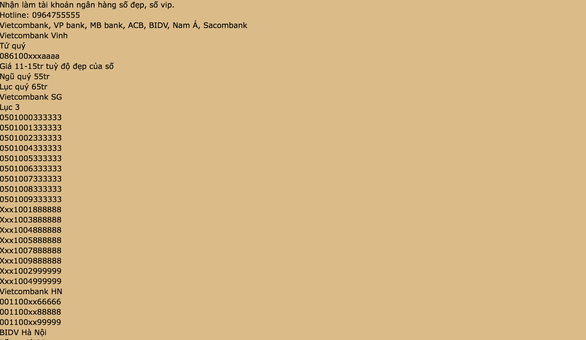 An ad of 'lucky' bank account numbers for sale is seen in this screenshot. Bank account numbers are usually assigned randomly by a computer software, so bank employees need to manually interfere with the system in order to select an account number at will, according to a leader of a major commercial bank in Ho Chi Minh City. “Previously, we only offer this service to our VIPs as a perk that doesn’t cost anything,” the banker said. However, some bank employees have exploited this policy to offer ‘lucky’ account number for sale on the black market. 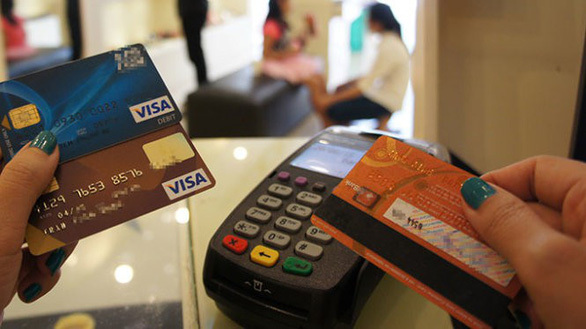 To prevent this, banks in Vietnam have decided to offer account number selection for all customers at prices much cheaper than they would have to pay through unofficial channels, he said. ‘Lucky’ account numbers from many banks are offered for sale on Vietnamese forums at up to VND65 million ($2,800) per number.